Every week we pull together some great Canadian recipes from Canadian food bloggers around the web featuring one main ingredient or dish. This week, we're showcasing Rosemary recipes. Find out how rosemary can be used in both sweet and savoury dishes. Uhhhmm! That's smell! Have you ever rubbed a tiny leaf of rosemary between your fingers? Of course you have! Isn't it amazing to get instantly perfumed by nature? How about infusing your entire house with that scent? That is exactly what happens when you add the oily spice to your homemade recipes. Rosemary is not only delicious to the nose, it is also one of those ingredients capable of brightening up or giving a special twist to otherwise conventional preparations. It is also versatile, as it can be used in a variety of dishes that can go from barbecued meats to delicate ice creams. Wanna know more? Check out how a group of FBC members used this "miracle herb" to create mouthwateringly desserts, appetizers and entrées and get cooking with Rosemary! 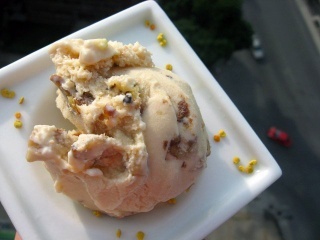 To make this [Rosemary Walnut Ice Cream](https://cultureatz.com/rosemary-walnut-ice-cream/?doing_wp_cron=1515278802.1907539367675781250000) remove the eggs but keep the heating process to infuse the natural oils out of the rosemary. From **CulturEatz**. To make these [Spicy Rosemary BBQ Potatoes](http://www.clockwatchingtart.com/2014/12/the-perfect-storm-spicy-rosemary-bbq.html), flavour-infuse your olive oil by getting it up to a low simmer over medium heat before adding six sprigs of fresh rosemary. From **Clockwatching Tart**. Making biscuits at home gives you the advantage of being able to flavour them with herbs and other seasonings, like these [Rosemary and Garlic Flavoured Biscuits](https://www.earthfoodandfire.com/homemade-biscuits/). From **Earth, Food and Fire**. This [Rosemary and Garlic Roast Beef with Butter Soaked Mushrooms](http://www.sneakymommies.com/rosemary-garlic-roast-beef-butter-soaked-mushrooms/) is a crowd pleaser and is actually very simple to make. As long as you have a meat thermometer you can’t go wrong. From **Sneaky Mommies**. The heavy herbal aroma in these [Rosemary Fig Scones](http://mdivadomestica.com/2018/01/rosemary-fig-scones/) is calmed by the smooth fig bits. The pairing will make you smile. From **MDivaDomestica**. [Rosemary Beet and Grapefruit Salad with a Shallot Vinaigrette](https://www.mykitchenlove.com/rosemary-beet-grapefruit-salad/) is a great make-ahead winter salad! When you roast the beets with rosemary and park sweet grapefruit on top, it’s not so difficult to get people on board. From **My Kitchen Love**. The piney-ness of the rosemary, crunches of sea salt and hint of olive oil in these [Rosemary Olive Oil Shortbread Cookies](http://www.creamandhoney.ca/blog-1/rosemary-olive-oil-shortbread-cookies) turn them into an addictive snack. From **Cream + Honey**. Tender [Chicken Breast in a Creamy Dijon Rosemary Sauce](https://www.saltandlavender.com/creamy-dijon-rosemary-chicken/) = an easy to make winter comfort food dinner you’ll devour. From **Salt and Lavender**. Use a regular pizza dough recipe, add tonnes of rosemary and the resulting [Rosemary & Sea Salt Focaccia](https://oldermommystillyummy.com/2013/09/rosemary-sea-salt-focaccia-recipe.html) will be beautifully light and delicious! From **Older Mommy Still Yummy**. The spring of rosemary in these [Pecan Polvorones with Moscovado and Rosemary Filling](https://www.thefinercookie.com/recipe/pecan-polvorones-with-muscovado-and-rosemary-filling/) gives them a special accent that no one will be able to resist. From **The Finer Cookie**. Click on the photos to be taken to the recipes! A big thank you to all our FBC Members who participated in our rosemary recipes roundup!